There’s One Pro-Choice Republican in the Texas Legislature. Soon There Could Be Zero. Sarah Davis is in the fight of her political life—against a governor from her own party. The only pro-choice Republican in the Texas legislature is fighting for her political life—and Democrats might not be her biggest threat. That’s because Texas Gov. Greg Abbott, a Republican known nationwide for his efforts to restrict immigration, abortion and transgender rights, is actively campaigning for her GOP challenger. Lacking a competitive primary of his own, Abbott is using his political clout and campaign cash in an effort to unseat three Republican incumbents in next week’s primary. He’s campaigned against all three in recent weeks, but he seems most fixated on defeating Rep. Sarah Davis, a popular, moderate Republican whose Houston-area district is largely made up of affluent, educated voters and encompasses Rice University and the sprawling Texas Medical Center. Friction between Abbott’s staunchly conservative allies and more moderate Republicans, such as Davis, has become the norm in the Lone Star State. The state House, led by moderate Republican Joe Straus, has often frustrated the plans of zealous conservatives in the state senate, which is spearheaded by Lt. Gov. Dan Patrick and is more closely aligned with Abbott. In October, Straus announced he would be stepping down at the end of his current term. A month later, Abbott took the unprecedented step of opposing Davis’ bid for re-election. Instead, he’s backing Susanna Dokupil, the CEO of a strategic communications firm who served as assistant solicitor general during Abbott’s tenure as the state’s attorney general. Dokupil has the backing of anti-abortion activists and at least one member of the Texas Freedom Caucus, a group of deeply conservative state representatives. Dokupil also has support from Texans for Vaccine Choice, a grassroots group that supports the ability of parents to opt out of vaccinating their children. 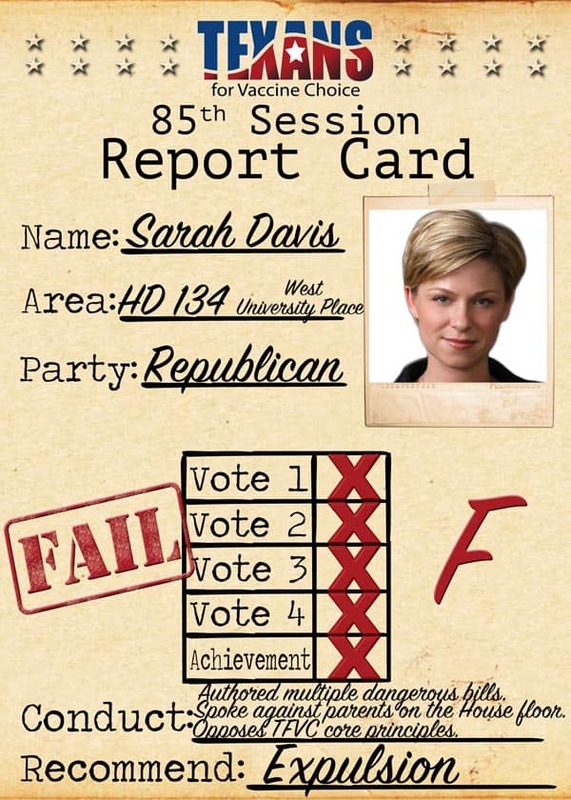 Davis received an “F” rating from the group in 2017 after she championed several pro-immunization bills—including one that would have allowed children, in lieu of their parents, to consent to receive vaccines that prevent cancer, such as the HPV vaccine. Anti-vaccine rhetoric is controversial in the district, which, according to the Houston Chronicle, has the highest concentration of physicians in the state. For her part, Dokupil has been largely silent on the issues of vaccines, but she did say that she supports removing cost barriers for parents who do vaccinate their children and that she and her children have been vaccinated. Vaccines aside, Dokupil appears committed to Abbott’s agenda. “The governor and I are going to have your back,” she said alongside Abbott at a campaign rally in Bellaire, a Houston suburb, according to Texas Monthly. Davis, by contrast, has frequently opposed the governor. She pushed back against key parts of Abbott’s 2017 legislative agenda, including his failed efforts to increase state funding of private schools and ban transgender people from using the bathroom that corresponds to their gender identity. Davis—along with the other two state representatives Abbott is trying to unseat, Wayne Faircloth of Galveston and Lyle Larson of San Antonio—also drew Abbott’s ire by siding against the governor in a fight over ethics reform. The three lawmakers backed unsuccessful legislation that would have barred governors from accepting hefty campaign donations from people who receive state appointments, a proposal that Abbott viewed as a slap in the face. A Texas Tribune analysis found that at least 71 of Abbott’s approximately 800 appointees had donated at least several thousand to his campaign in recent years. In reality, says Rice University political scientist Mark Jones, Davis should be viewed as “the Texas House’s one true independent.” In 2017, Davis voted more conservatively than every Democrat in the House, but more liberally than every other Republican—including Faircloth and Larson — according to Jones’ analysis of roll-call votes during the most recent regular legislative session. Despite the high-profile clashes with her own party, Davis has also sided with conservatives on a host of controversial issues, including backing a measure that requires local law enforcement agencies to enforce federal immigration laws. Campaigning against Sarah Davis, though, could tarnish Abbott’s reputation among Houston-area moderates. It could also make it much harder in November for Republicans to hold onto Davis’ seat, a purple-ish district that Hillary Clinton won by 15 percentage points in 2016. A viable Democratic candidate could flip the district if faced with a conservative Republican opponent, Davis told Texas Monthly. Indeed, Democrats may have found such a candidate in Allison Lami Sawyer, a 33-year-old who owns an oil and gas safety company. “This is a swing district, and you have to be able to have nuanced positions and understand who all you represent,” Davis said to Texas Monthly. As to whether she’ll be backing Abbott in November: It’s complicated. Davis told the Texas Tribune she won’t vote for a Democrat for governor, but she isn’t likely to cast her ballot for Abbott either.